Out with the old and in with the new. It’s a statement I’m embracing for the change of one year to another. It’s certainly different around the house. Getting new furniture gave the perfect reason to go through and decide what to keep, trash, or donate. It gave me incentive to tackle my pantry too. One thing I had an abundance of turned into Amaretto Rice Pudding. How does rice seem to accumulate in the pantry? I had partial packages of regular long grain white, brown, yellow, basmati, arborio, instant, quick cooking, and glutinous. Something had to go. So I picked long grain white and made a big batch. Then I remembered my dad making rice pudding long ago. 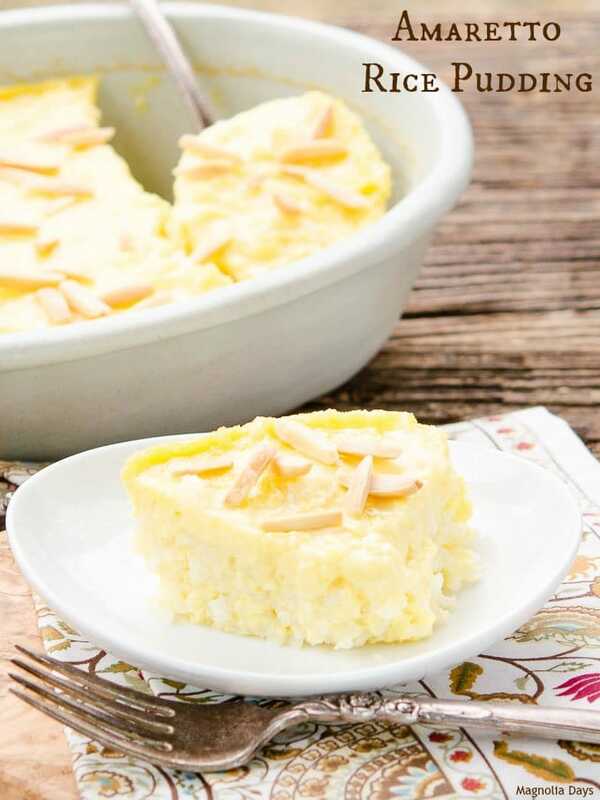 It really is a classic way thrifty folks would turn leftover rice into a dessert. A little milk, sugar, and eggs is really all you need. I added amaretto and almonds in for added flavor and a little decadence. There are two basic types of rice pudding. One is cooked on the stove (or in a slow-cooker). The stove-top version is creamy and more pudding-like. 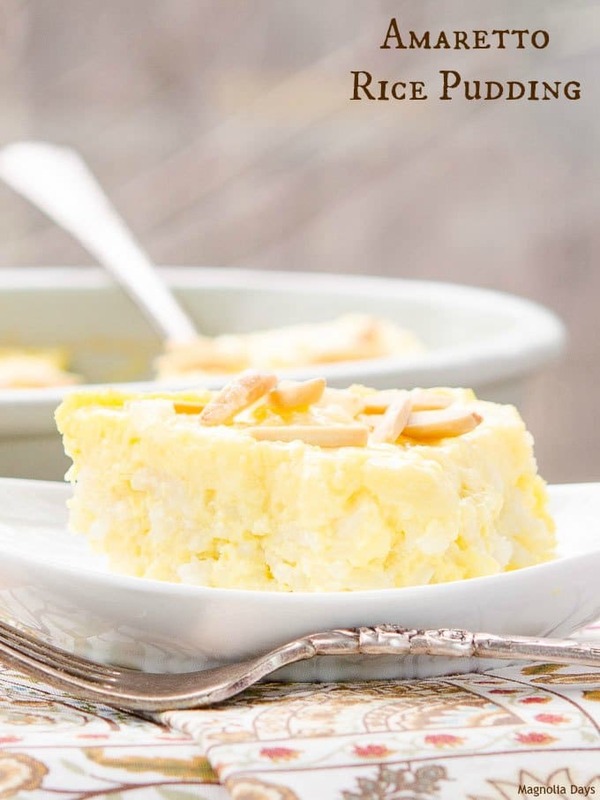 See my Kheer (Indian Rice Pudding) for an example of it. The other is baked. The baked version is thicker and can be cut into portions (or spooned out as I did). Amaretto Rice Pudding is baked. 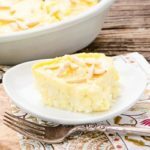 You simply whisk together eggs and sugar then stir in milk, amaretto, butter, and rice. Pour it into a dish and bake it. No water bath is needed. Sprinkle toasted slivered almonds on top and serve. It is best when it is just-baked and warm. 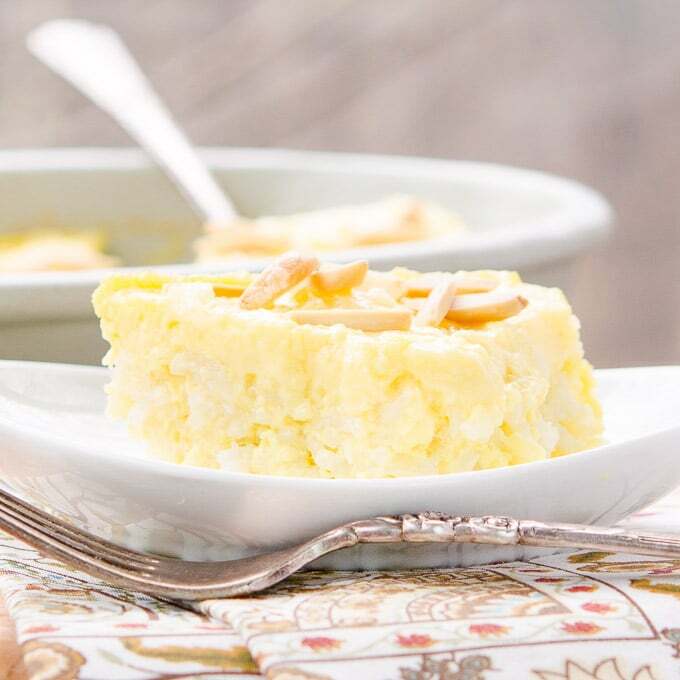 Amaretto Rice Pudding is a classic dessert made with leftover rice. It's satisfying comfort food with a delightful almond flavor. Preheat oven to 325°F. Butter a 1-quart baking dish. Whisk together eggs and sugar in a large bowl. Add milk, amaretto, butter and salt. Whisk until combined. Stir in rice. Pour into prepared baking dish. Bake for 35 to 40 minutes, until center is just set. I love the flavor of Amaretto.